Soho is where people in New York City go if they’re looking to shop for more high-end brands like Ralph Lauren and Moncler, or if they’re trying to look like a stylish British twentysomething by going to Topshop. This lower Manhattan neighborhood attracts countless shoppers from in and out of town, and could arguably be called the capital of one of the planet’s most fashionable cities. If you are, or want to be considered, a well-known brand among the fashion-minded, you open a shop in Soho. RELATED: What Can Save Abercrombie and Fitch? Founded in Pennsylvania in 1830, Woolrich proudly sports the tagline, “The original outdoor company,” and – speaking from personal experience – makes some of the most comfortable wool socks you will ever wear, perfect for a hike on a February day, or playing hockey out on a frozen pond. The company has earned a reputation as one of America’s great brands for a sort of rugged lifestyle that’s in vogue right now, which would probably explain Woolrich’s willingness to open their first North American store in Manhattan, rather than anywhere near the Pennsylvania town the brand is named for. And while waiting almost 185 years to open your Soho location might seem like a really long while, there’s probably no better time than now for the company to make an even bigger impact. 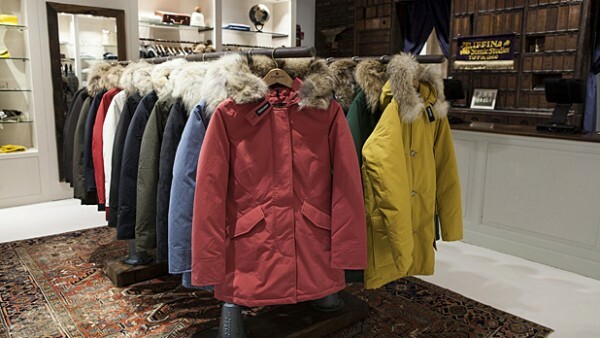 The new Woolrich store is filled with flannels that will keep you warm and looking good, parkas, and Hudson Bay blankets. It’s decorated less like the place where your dad and his pals drank Old Milwaukee and watched college football, and more like, well, a high-end clothing shop – the rare kind of store people who hate shopping don’t mind walking into. It’s impeccably arranged with Persian rugs on the floors and plenty of glass, wood, and lights that look like they could hang the office of some Pittsburgh steel mill sometime around the turn of the century. And, of course, vintage knick-knacks. You get the cool vibe, but it also somehow seems as authentic as anything in Soho can. After close to two centuries of existence, few brands deserve to be in a big time shopping district the way Woolrich does, and they pull it off without laying it on too thick. There’s balance between the brand’s past and the stylish neighborhood they’ve opened up shop in. The term “Heritage brand” is one that bloggers have been using for a few years now that Woolrich often gets tagged with, along with Filson and Red Wing. If your dad or grandpa wore it while fixing something in the garage, and now some stylish guy who sits behind a desk all day sports it to work, it falls under the “heritage brand” category. Of course, that guy is paying far more than your father would have back in the day when those brands were simply considered functional and comfortable over all else. Now, unfortunately, there’s a term for guys who wear heritage brands: “Lumbersexual,” a trend already written up in Time and Buzzfeed to describe basically any guy with a beard who happens to be wearing a flannel. Here’s hoping the term doesn’t make it far into 2015, but for the time being, to paraphrase Derek Zoolander’s nemesis, Mugatu: Lumbersexual. So hot right now. Lumbersexual. 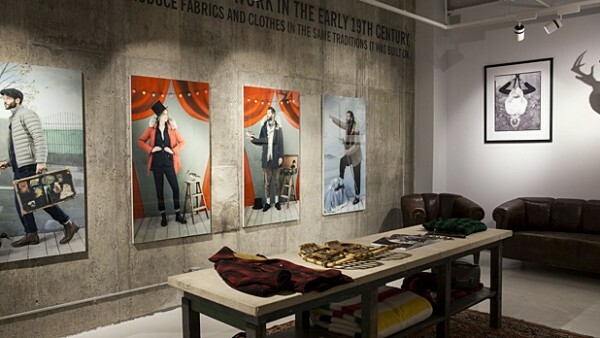 But cashing in on those trends isn’t really why Woolrich is opening up a Soho store, of course. They have the kind of cred and history that other brands try to look like they have, but time doesn’t really lie. The fact is that if you’re going to try and get the same shoppers that go looking for brands like Jack Spade and Barbour, having a physical store in the same neighborhood is the best way of going about it. Lumbersexual was created by a writer to try and capture a trend that has really been going on for a few years now, and while Woolrich the company and the new store might benefit from it in the short-term, you don’t stick around for nearly 200 years by cashing in on trends. Trends come and go; it’s quality that endures. Stepping into the polished new Woolrich store, you get the feeling that the company is abandoning the ideals that have sustained them since before the Civil War in favor of luxury. But the flagship is also an example for other brands looking to make the transition from weekend sportsman to the strange world of fashion.